The sports car you’ve been waiting for has arrived. 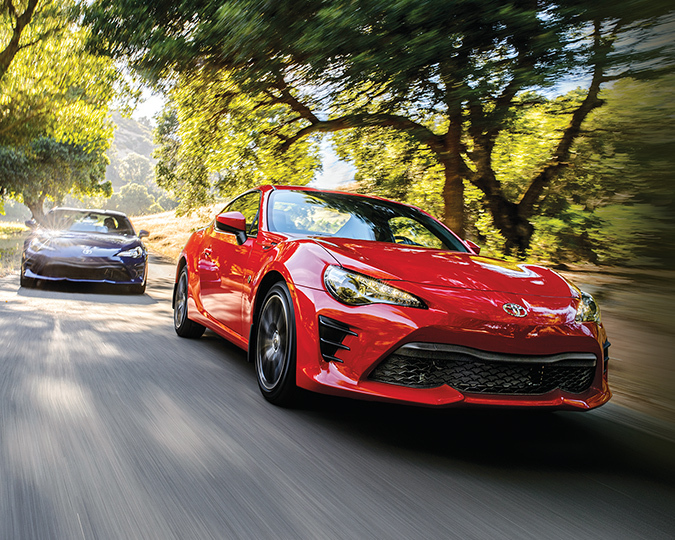 The 2018 Toyota 86 is turning heads, and for good reason. The Flat 4 Boxer engine offers superior performance, while intuitive technology offers ease on the road. Choose from four distinct models, including 86 6M, 86 6A, 86 6M GT and 86 6A GT. Panning around the exterior of the 2018 Toyota 86, it is evidently refined with distinct lines and a powerful front-end design. A wide grille and angular LED headlights highlight the sharp lines of the 86’s front end. The dual exhaust, shark fin antenna and available rear spoiler accentuate the overall sportiness. The body’s lightweight construction ensures agility and responsiveness on the road. 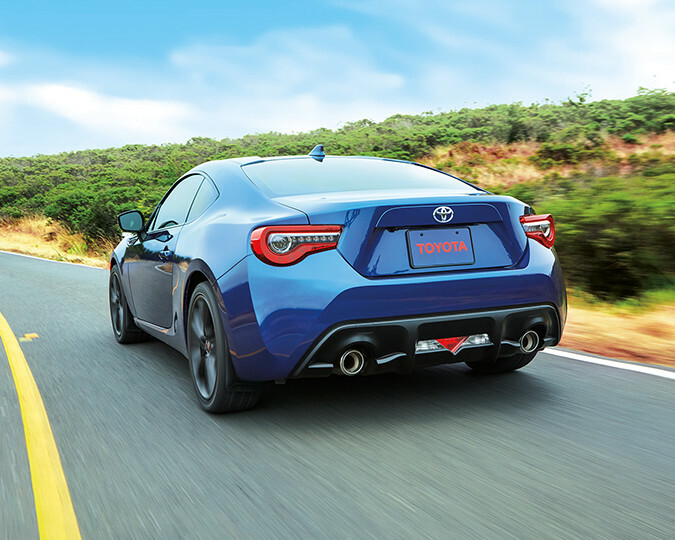 The aerodynamically designed Toyota 86 stands strong on 17″ aluminium alloy wheels. Power-adjustable, colour-keyed heated mirrors come standard to fight against the elements, with the option of also adding LED fog lamps to further combat whatever Mother Nature throws your way. Feel at ease inside the 2018 Toyota 86 with refined touches and luxurious appointments. Front sport bucket seats are dawned with available leather upholstery and heat function. 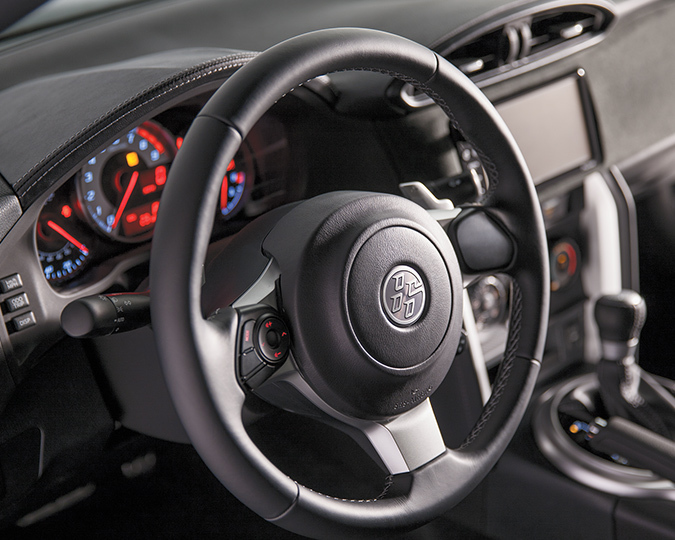 Grip the leather-wrapped steering wheel and shift knob to taste the thrill of the road. Drivers are able to stay engaged with the road thanks to the manual 6-way driver seat with recline, vertical, fore/aft adjustments. The flat folding rear seats and passenger side rear walk-in assist work together to optimize cabin versatility. Available dual-zone automatic climate control offers superior comfort to both driver and passengers. The available push-button start Smart Key System means you’re ready to hit the road with the push of a button. Intuitively designed technology lines the 2018 Toyota 86. Toyota ensures you are engaged and in control with an array of entertainment and technology features. The 7” Touch Panel Display Audio System comes equipped with an AM/FM stereo. It also features USB input port, Bluetooth Hands-Free Phone Connectivity with Wireless Audio Streaming and Phone Book Access. Blast the tunes over 8 speakers. Steering wheel audio controls allow you to control the volume without removing your hands from the wheel. A backup camera is provided as a standard feature to optimize safety. Take advantage of alluring accessories clad in luxury or take your 2018 Toyota 86’s performance to the next level thanks to Toyota’s Genuine Accessories. Each are custom designed and built to fit your Toyota 86, and are equipped with a Toyota Warranty. Add features such as cargo liner and tote, fog lamps, hood deflector, Pro Series Paint Protection Film, rear spoiler, and Toyota Genuine Dash Camera. Plus choose from an array of TRD Accessories such as TRD 18” Alloy Wheel (Staggered Fitment) Black, TRD Air Filter, TRD Exhaust System, TRD Performance Intake, TRD Performance Sway Bars, and more! The revolutionary power of the 2018 Toyota 86 is undeniable as you experience its innovative combination of performance and efficiency. Featuring a 2.0L Boxer engine and a low centre of gravity, this vehicle delivers astonishing stability and control. Being the world’s only boxer engine with rear-wheel drive configuration, you are given the benefit of maximized steering ability and groundbreaking agility thanks to separated driving power and steering functions. Combine this with a 6-speed manual or automatic transmission and prepare yourself for the ride of a lifetime. Crafted from an understanding of driving desire, the 2018 Toyota 86 stands out from the crowd with performance, agility, efficiency, luxury and grace. You are not going to want to leave it in the driveway for long as its powerful design draws you in and offers you the opportunity of a lifetime. Check out the 2018 Toyota 86 at your local Edmonton Toyota dealer – Gateway Toyota. Through a dedication to hard work and understanding customer needs, Gateway Toyota is proud to be your go-to Toyota dealer.